Japanese 20th century vase by Japan Living National Treasure, Tokuda Yasokichi III, born Tokuda Masahiko in Komatsu, Japan. Vase is of small eggplant form with short slender top. 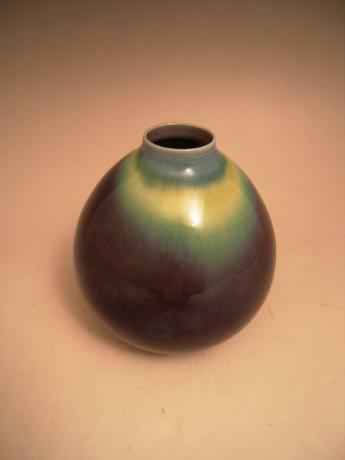 The overall glaze is a dark eggplant color with blue, yellow and green on the top portion. Tokuda Yasokichi III became..
Japanese 20th century vase by Japan Living National Treasure, Tokuda Yasokichi III, born Tokuda Masahiko in Komatsu, Japan. 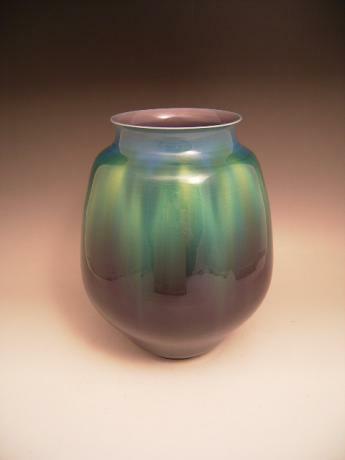 Vase is of large oval form with wide neck and flared rim top. Tokuda Yasokichi III became Living National Treasure in 1997 and is recognized for work with Saiyu, glaze color ..
Japanese 20th Century INOUE MANJI white porcelain bamboo design vase. 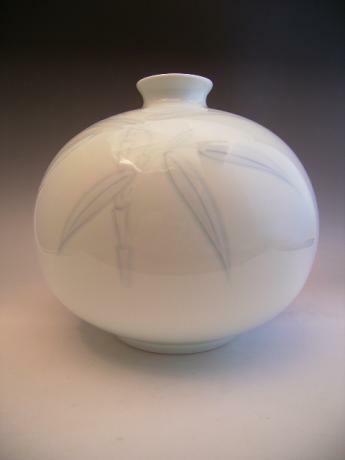 The bamboo design is incised into the porcelain with pale blue glaze. Made by master artist, INOUE MANJI, Japanese National Treasure. 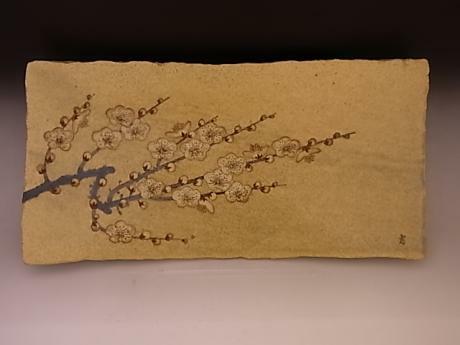 INOUE MANJI was born in 1929, was selected for his work with HAKUJI, white porcelain and is ..
Japanese 20th Century YOSHIDA MINORI camelia design vase. 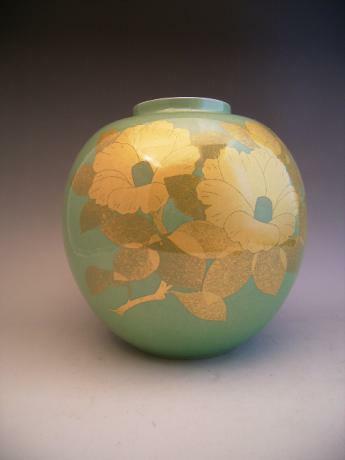 The gold camelia design is done over a pale porcelain green base and covered with a clear enamel and fired again. Made by master artist, YOSHIDA MINORI, Japanese National Treasure. 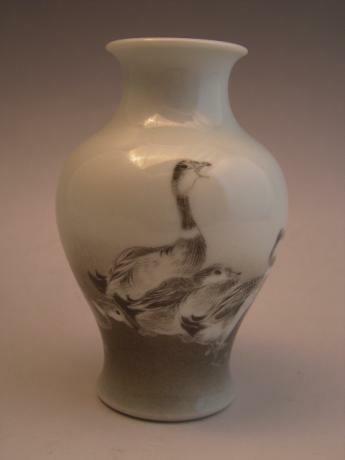 YOSHIDA MINORI was born in 1932, was selected for his work ..
Late 19th or Early 20th Century duck design miniature vase. Signed by artist, MAKUZU KOZAN SEI on base. 6 ducks painted in charcoal gray color on white porcelain. 4.5" height by 2.5" wide. Japanese early 20th century MAKUZU KOZAN porcelain vase. 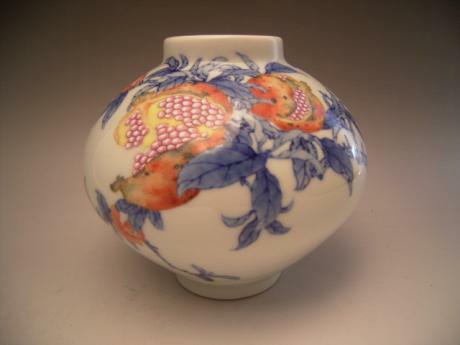 The vase has a design of pomegranates with leaves, blossoms and fruit. The leaves and branches are done in underglaze blue and the pomegranate fruit and blossom are done in overglaze enamels. Signed MAKUZU on bottom. Japanese early 20th century bamboo flower basket. The long slender basket form is woven with bamboo strips of varying widths. The handle is made from stalks of whole bamboo. The basket is unsigned. The basket mesures 16 1/4" tall and is 4 1/2" in diameter. Japanese early 20th century bamboo flower basket. The cylindrical shaped basket has 4 feet formed by 4 bamboo stalks that have been stripped and become a part of the basket above the feet. 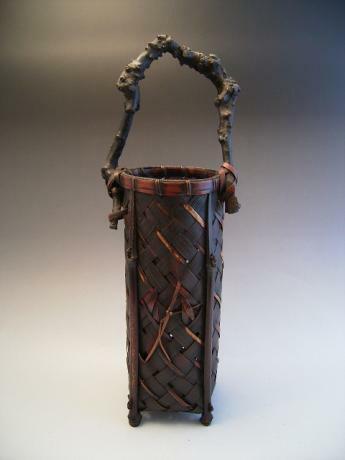 The basket has a handle formed by a piece of mulberry root. Unsigned. 17" tall by 4.5" wide. Japanese early 20th century bamboo flower basket. 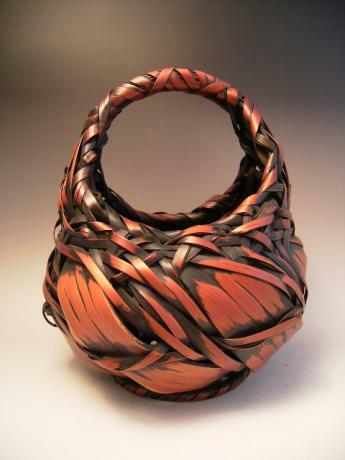 The basket is woven with thick and medium bamboo strips. 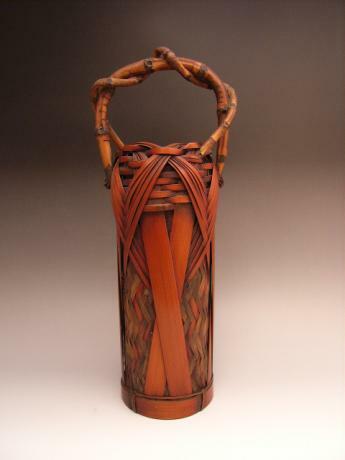 The basket measures 12 1/2" tall, 10 1/2" wide and 11" deep. The bottom is a circular shape.